Building on last year's most successful poker title and the number one brand in poker, World Series of Poker®: Tournament of Champions takes a story-based approach. Take a seat next to Chris "Jesus" Ferguson as his protégé, a new professional poker player. Face more pros than ever: Put your poker skills to the ultimate test against more than 20 of the world's top poker players, the most poker pros every collected in a video game. Raise and bluff against Scotty Nguyen, Scott Fischman, Clonie Gowen, T.J. Cloutier, Antonio Esfandiari and many others. Expect stellar creative commentary every step of the way from the announcing team of Norman Chad and Lon McEachern. Learn from the best: Not just a sequel to last year's top-selling poker video game, this is high-stakes poker all the way. Check your amateur status at the door and head out on the Circuit as a poker pro. You're not alone, though, you're under the watchful eye of "Jesus" Ferguson, winner of five WSOP bracelets. Ferguson will teach you the personal tricks and strategies that have made him one of the world's foremost poker players. But in the end, you're on your own, your experience, your knowledge and your talent on display at the world's toughest poker stage—The World Series of Poker's Tournament of Champions. Unlock winning tools: With successful wins, unlock valuable tools that help you bring a better game to the table. Unlock the ability to check the odds of hitting various hands at every stage of the deal, check the rank of your hand, and even check statistics and percentages of the hands your opponents are fishing for. Show your face: Put yourself in the game with the proprietary DigiMask™ technology specifically licensed for this title. Use your Xbox 360™ camera to map your likeness on your own in-game character. Will your poker face stand up to the pressure? Expand your game: Raise the stakes with Xbox Live® play: Host multi-table tourneys, read your opponents tells via camera footage, or even test your psychic skills by playing "Blind Man's Bluff." Featuring a distinct noir comic book aesthetic, players are challenged to crush or be crushed in the white-knuckle racing and car destruction game. 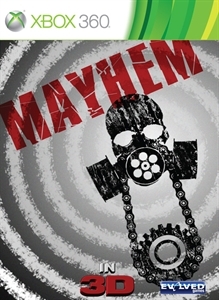 Highly customizable for hours of opponent pummeling entertainment, Mayhem boasts 20 levels in five arenas and four exciting game modes, including Demolition Derby, an intense contest to be the last one..